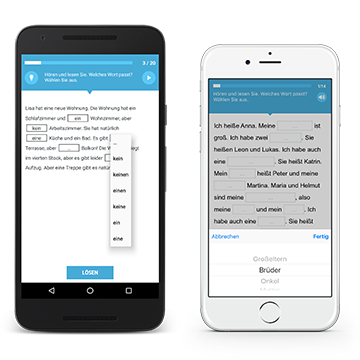 The German Traces app of Goethe-Institute continues to grow. Along with Ukraine very recently also Greece was added. A large packet with 450 MB and more than 60 traces of German history in Greece. Very nicely researched and almost every trace features an audio track with background information. Visitors of Athens and Thessaloniki are sent off discovering landmarks of the German-Greek past. Using their smart phones or tablets they can travel King Otto’s Greece or visit historical references of the German occupation of Greece. Deutsch für Dich turned 3! We had an anniversary to celebrate. Deutsch für Dich, Goethe-Institute’s community for people who want to practice English, just turned three. 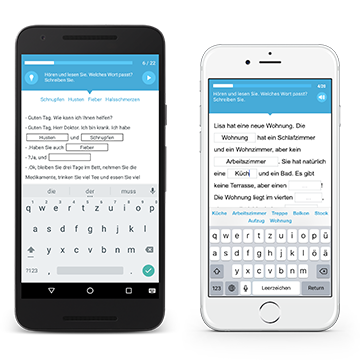 More than 230,000 members from all over the world use the platform to practice the German language. 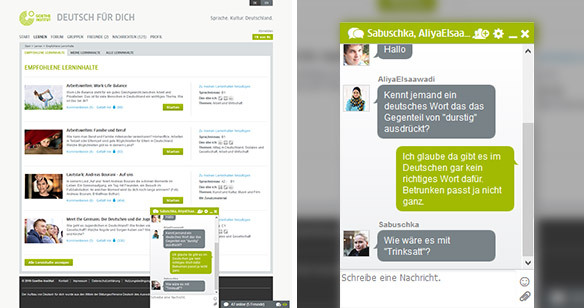 Just in time of the anniversary a new landing page and a multi-user chat function were added. Now, it is possible to chat with more than one person at a time. Being one of the most popular features of the community, with more than 4.5 million chat messages by now, the new feature is being well received. Also, a VIP visited the headquarter of Goethe-Institute in Munich. During his visit Frank-Walter Steinmeier, foreign secretary of Germany, also learnt about Deutsch für Dich. It was the ninth edition, only one year before its 10th anniversary in 2017. Together with Dr. Klaus Ceynowa, Director General of the Bavarian State Library (BSB), Markus presented the indoor navigation project for BSB. Also, Markus once again curated the Emerging Technology track, this time with cool talks on machine learning, quantum computers and autonomous driving. Munich’s MobileTech’s little sister in Berlin: as always with an excellent programme, fantastic weather and great location. Markus held two talks. 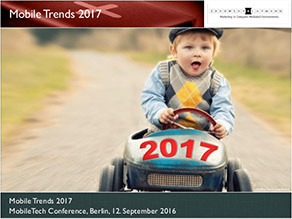 The first one was on mobile trends for 2017, with an XL issue ahead at the spring edition of MobileTech in Munich. 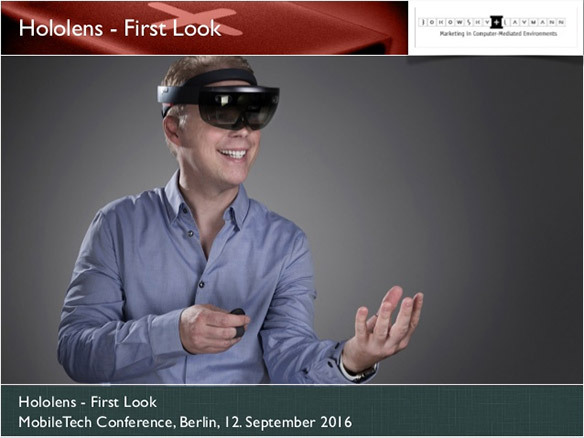 In a short talk, Markus presented the all new Microsoft HoloLens. We are among only few companies to own a HoloLens since middle of the year. For the time being we are experimenting with it and are building first demos. But we can already state that it is by far the most exciting Augmented Reality device in the market. 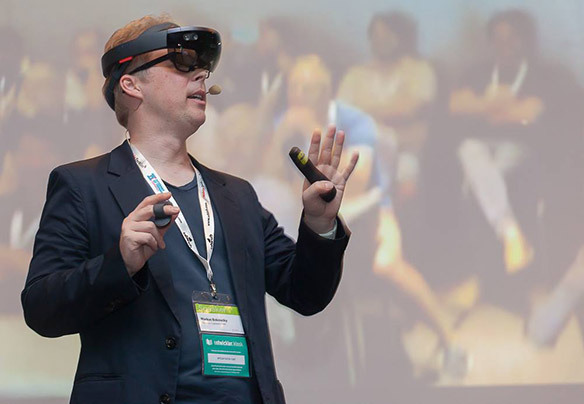 You’ll find a summary of Markus’ talk on mobile trends on entwickler.de, along with a report on the HoloLens talk and also an interview in JaXenter. It is time again, the big mobile trends round-up is here again. What can we expect for our devices next year, which new mobile devices are coming, what role will IoT play? Apps will become services, messenger apps turn into comprehensive tools, bots are conquering the services and in the background machine learning will always be around, though invisible. Thanks to Pokémon Go and HoloLens, Augmented Reality is going through its third adolescence. What’s new in the eHealth and FinTech area? Markus Bokowsky is giving an overview over the expected trends in the near future and is attempting to give a big picture in a wider context. “This has been one of the most fascinating Augmented Reality experiences so far”, said Markus Bokowsky after his first test of HoloLens. Bokowsky + Laymann is heavily experimenting with the Developer Sample, and first demo applications are being developed. 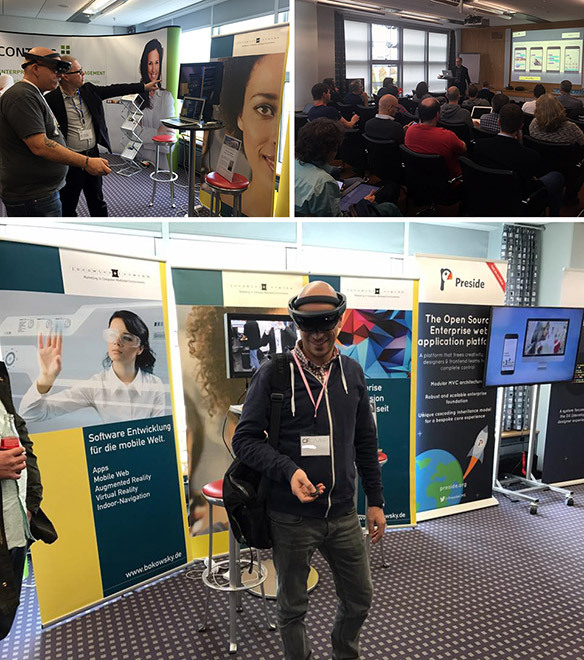 Together with the attendees he is having a closer look on the applications on board, is watching 2D and 3D content and playing with virtual holograms in the real-life conference room at nhow Berlin. We also had a booth at CFCamp. We brought the HoloLens, and our visitors had lots of fun glimpsing into the future of Augmented Reality. Please see the blog post from our colleagues at Contens to get a full report of the conference including many pictures. Well, I feel a bit embarrassed to present this one shortly before Christmas, but it has not been featured so far in the newsletter – and this time, it is really good. Also it was recorded on the last sunny day of the year, so not that long ago. This time with Christoph Ebert sub for Tom Wießeckel – plus a decent rock star backdrop. Webinale 2016 – Emerging Technology Day is back! Time flies…after re:publica is before Webinale, which will start next week. Apart from the Emerging Technologies Track which was curated by Markus and which we will feature in detail below, we strongly recommend the keynotes on Tuesday. We are looking forward to seeing both Richard Gutjahr (Code Wars – The Source Awakens), who needs no further introduction, and Paul Bakaus (Amplifying the Web). 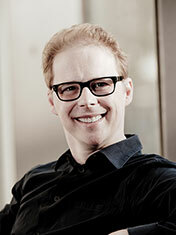 Paul is a HTML5 veteran, the former Lead Developer of jQuery UI and meanwhile checked in at Google. We are excited about what Paul is going to tell us. 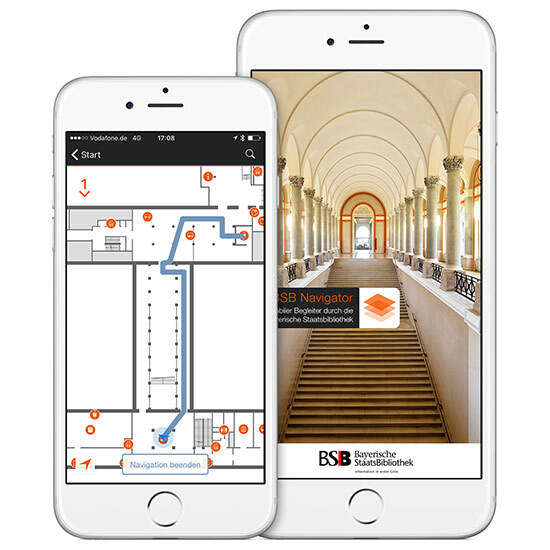 For those interested in indoor navigation with iBeacons, we recommend a lecture by Markus together with Dr. Klaus Ceynowa, President of Bavarian State Library, in which they present the BSB Navigator, the Beacon-based indoor navigation app of BSB. Emerging Technology Day is back again! After a one-year break we are now ready for round two. Again we will be dealing with issues and developments, which currently have no effects on our daily business – but will most likely gain much importance soon. After having discussed cyborgs, crypto currencies and wearables last time, this year’s topics will include quantum computers, AI, neuronal networks, deep learning, autonomous driving and Google’s Search Inside Yourself programme. Markus curated this track and will also host the event. 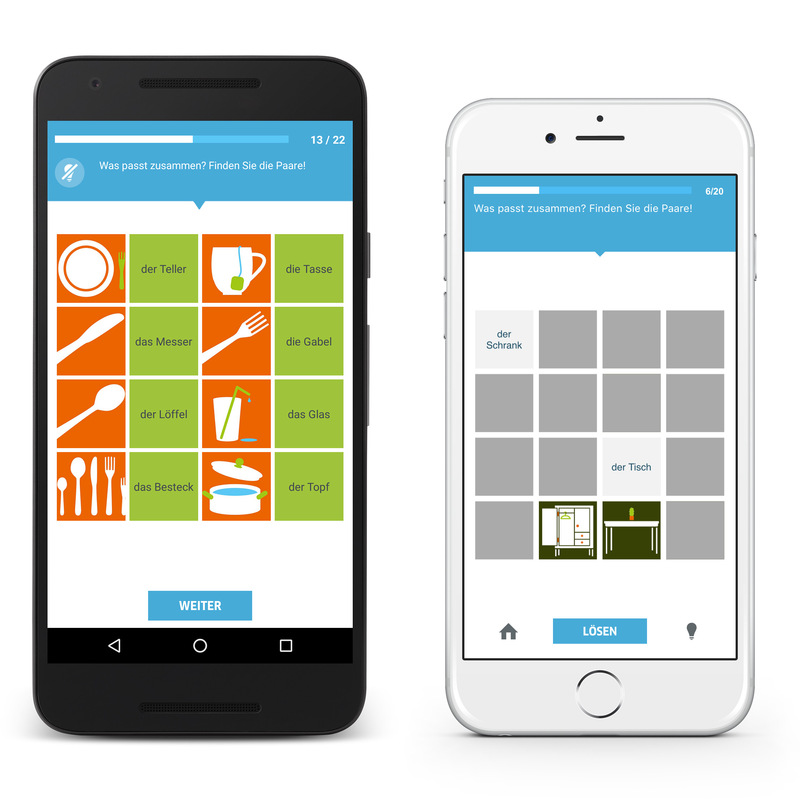 Indoor Navigation with Beacons – How does it work actually? We already reported extensively about the BSB Navigator in earlier issues of the newsletter. To explain the technology a bit more in detail, we added a new video. Enjoy! Who wants to learn more: Dr. Klaus Ceynowa and Markus Bokowsky wrote an expert article, now available at our Knowledge Base (German only). We would like to take the opportunity to point out one of our long-term projects which is constantly being further developed. 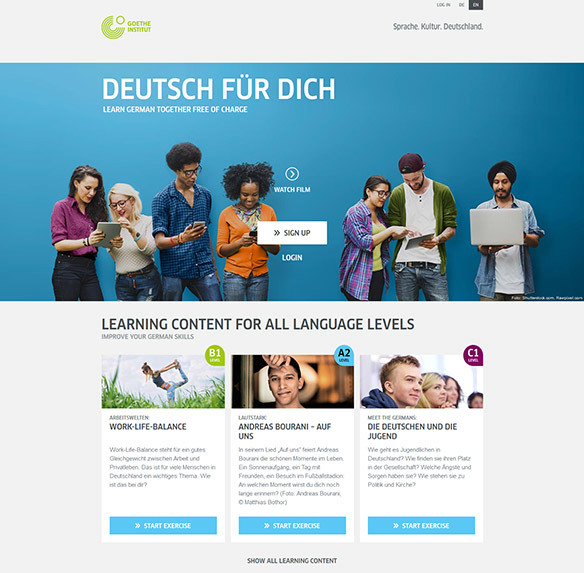 Deutsch für Dich: the community of Goethe Institut for people learning German. The community already has over 180,000 members from all over the world. Recently a feature for starting groups was added. Every member can start a group to bundle discussions and materials according to topics. We are very excited how the users will adopt this new feature. Following the tradition, we are presenting a Best-of selection of lectures filmed at re:publica. In the anniversary year, we have almost only speakers who appeared at one of the earlier nine re:publica events. A veteran at re:publica, this time with cargo cult and beautiful pictures of the Burning Man Festival. In his speech in 2014 he manoeuvred himself onto the sidelines a bit: “If you wont’t stop controlling us, I will quit the game.” Surprise: They did not stop, so Sascha skipped last year’s event. But now he is back in the game, with the only possible attitude: Still! Fanfiction anyone? YES. Fantastic Laurie Penny talks about furries, love among clingons and other important things. We love re:publica for talks like this one, don’t miss! How does all this malware manage to enter my computer although I never click shady mail attachments? It could have been a banner ad on the internet. Thorsten Schröder from CCC and Frank Rieger explain how this works and what you (theoretically) can do to avoid this. “Singularity is not our biggest problem.” If not, what else? Kate Crawford lifted the secret. What kind of mail do members of the German parliament actually receive? Well, quite diverse things such as serious matters but also lots of conspiracy theories and nonsense. Four employees from parliament members read from their favourite e-mails and faxes. 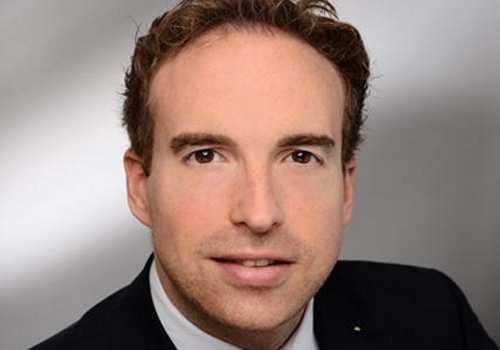 Moritz Riesewieck: COMMERCIAL CONTENT MODERATION – LITTER SERVICE ON THE INTERNET! Who is actually deleting all the crap from the social networks? Algorithms? Unfortunately not – people in call-centers on the Philippines do. What importance do smartphones have for refugees during their escape and after? A very high one, of course. Noor Nazrabi is presenting the first study on this topic. 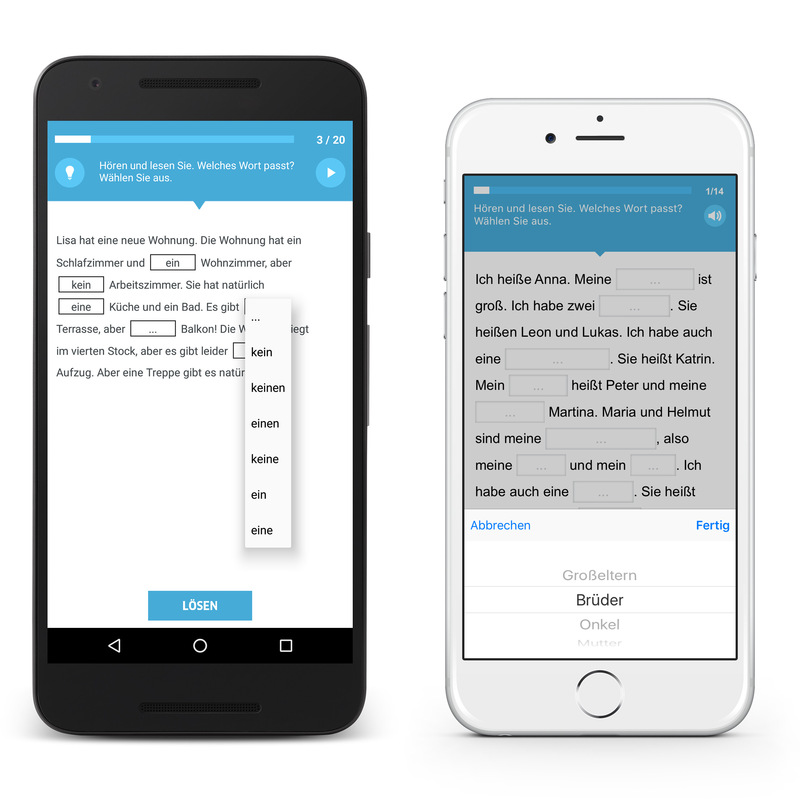 How do I count in German? What are the names of foods? How do I tell the time in German? What are the German words for family members? How can I plan a trip together with others? 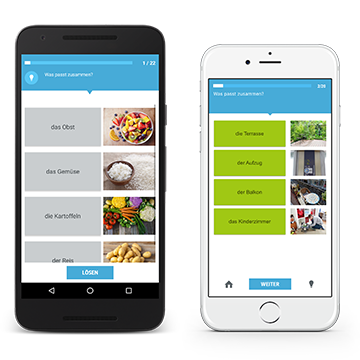 In 10 chapters people who want to learn German on level A1 (beginners) can train vocabulary and grammar on everyday topics such as names of foods, furniture and professions as well as the time and paying the bill in a restaurant. Also you can listen to people planning a trip together. 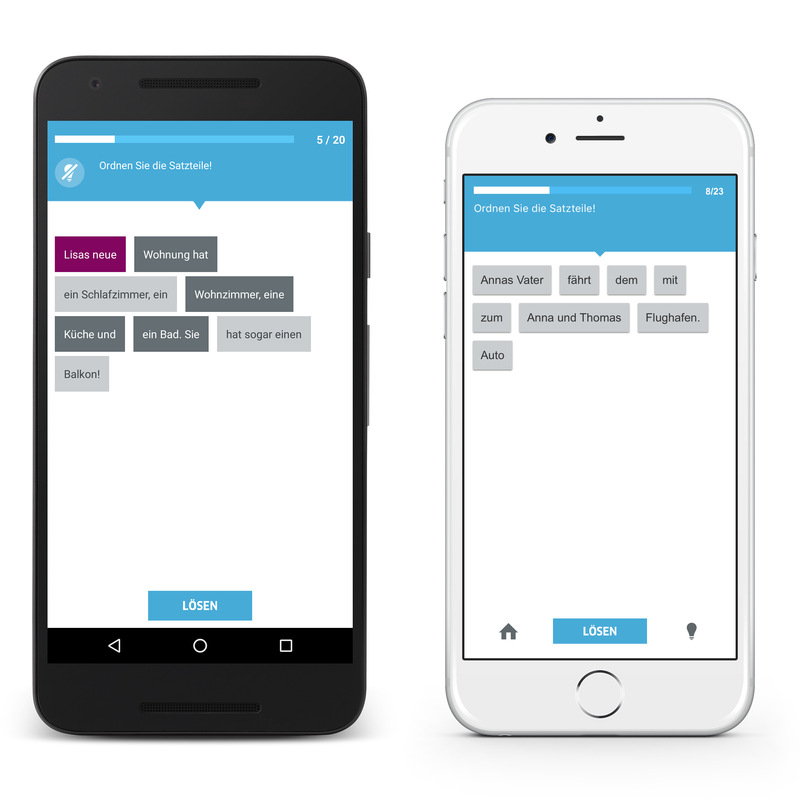 The app combines listening, reading and writing and also helps to train basic vocabulary. The content is structured into 10 chapters with each 14 to 33 individual exercises per chapter. There are ten different types of exercises, ranging from simple selection to the correct word order of sentences. 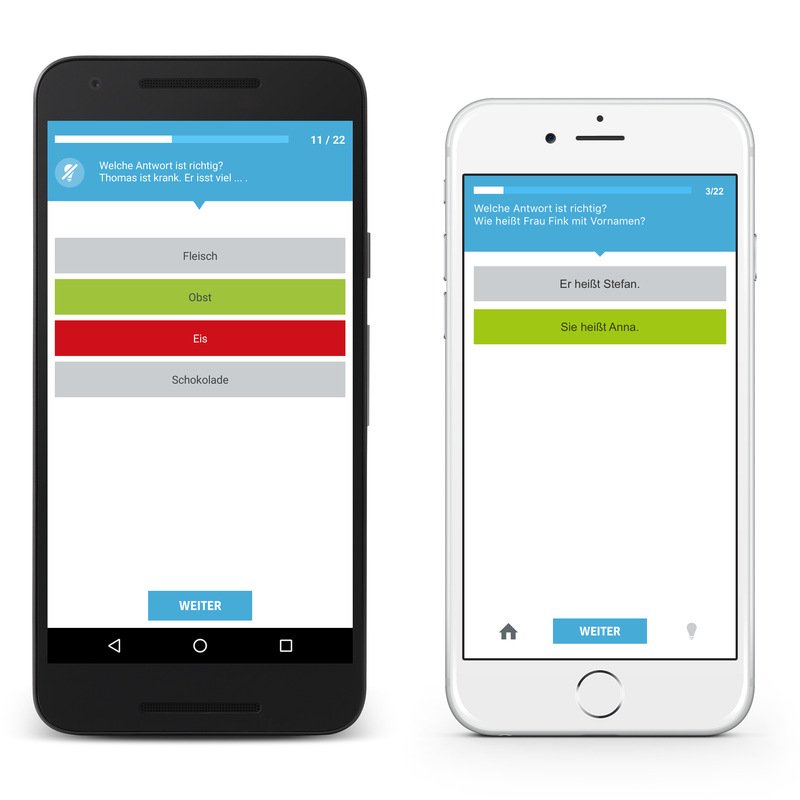 All correct answers are rewarded with points which can be accumulated over all chapters. 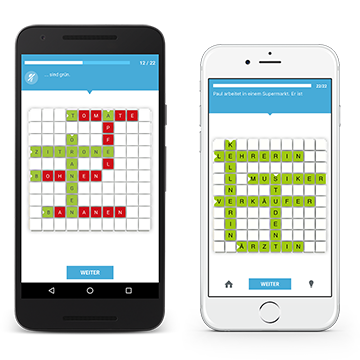 The user is allowed to repeat each chapter any number of times and by doing so improving the personal high score. If the user is stuck, the hint function will help. Many of the exercises also feature audio dialogues. More than one of the answers may be correct. The words of the sentence have to be arranged in the correct order. The words can be moved by touch. In this exercise, not the words, but a couple of sentences have to be put into the right order. The words have to be assigned to the appropriate pictures. The correct words have to be filled into the gaps with a choice of words to select from. The correct words to fill into the gaps have to be found out without given choices. Just like a classical crossword puzzle: the correct words have to be entered. Probably the hardest type of exercise: the correct words have to be found in the bustle of letters. The cards have to be tapped to uncover. The appropriate word has to be assigned to each picture. 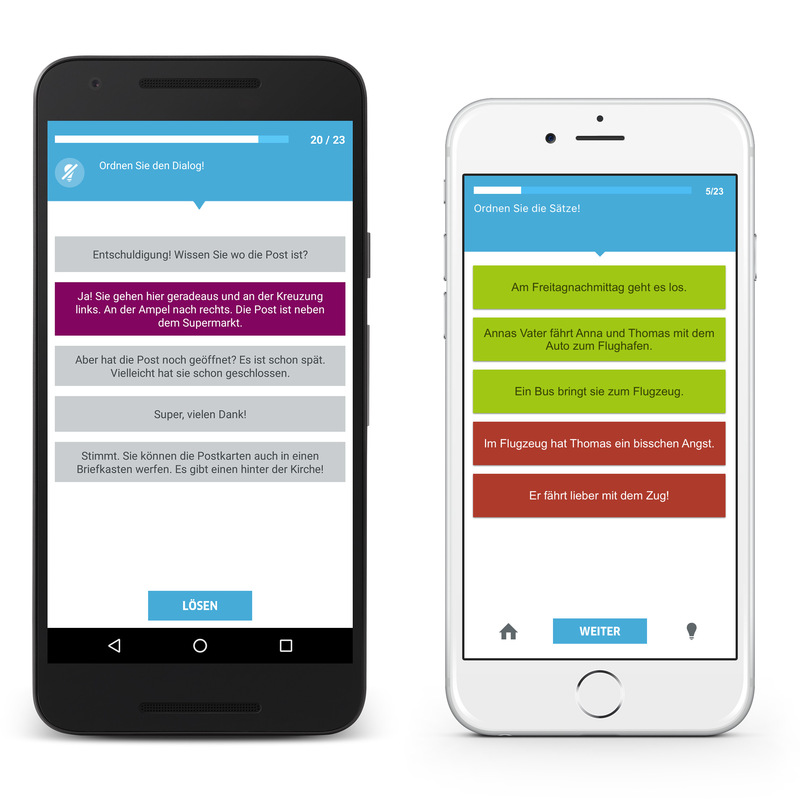 The individual exercises were developed by German learning experts at Goethe-Institut using the CBT authoring tool Hot Potatoes. This freeware is popular in the educational area to create language exercises for the Internet. We develped an importer which reads the internal XML structure of Hot Potatoes and converts the exercises into native code for Objective-C and Java. By doing so the creators of the exercises did not have to learn using a new tool and we still benefit from native code without the need of Webviews or other workarounds. 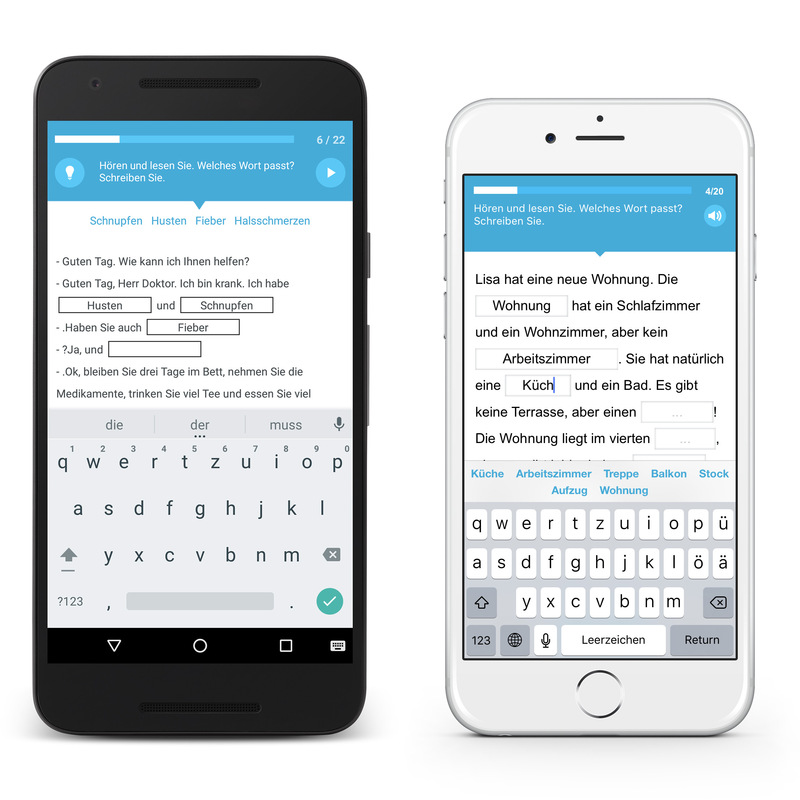 Another advantage of this method is that we are able to write more apps with new exercises based on this importer technology. 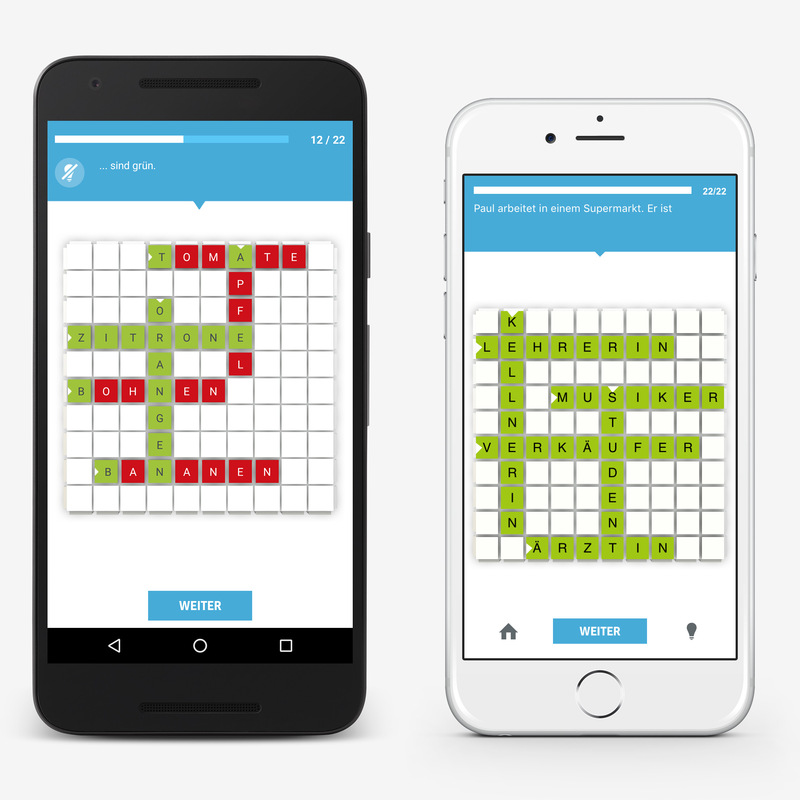 The app is now available for iOS and Android in app stores free of charge. 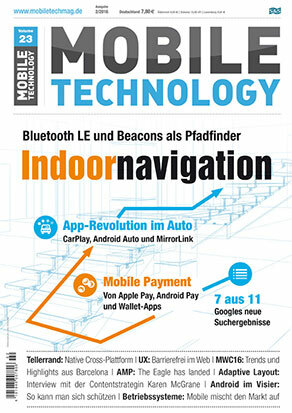 One more thing on the BSB Navigator: Who wants to learn about the technical background oft he app should not miss the upcoming issue of Mobile Technology Magazin. Dr. Klaus Ceynowa, Director General of the Bavarian State Library, and Markus Bokowsky cover the background and lessons learned of the project on eight pages. It was a pleasure for us. #mtc16 again took place in Munich and we were in. At the booth we featured an Easter Raffle and answered lots of questions around indoor navigation with beacons. This was also the topic of Markus’ speech – here are the slides. Also Markus was part of a panel discussion on “Trends to Watch on Mobile” on Tuesday morning in the keynote room. 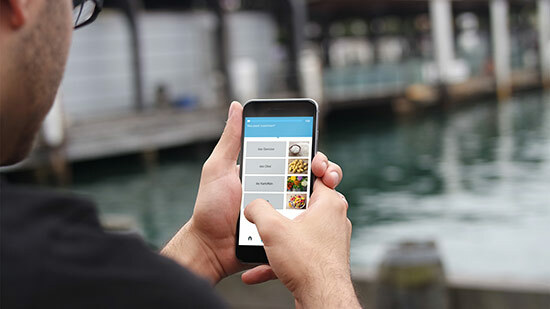 Beacons are key technologies in location-based marketing. But are they also suitable for indoor navigation? 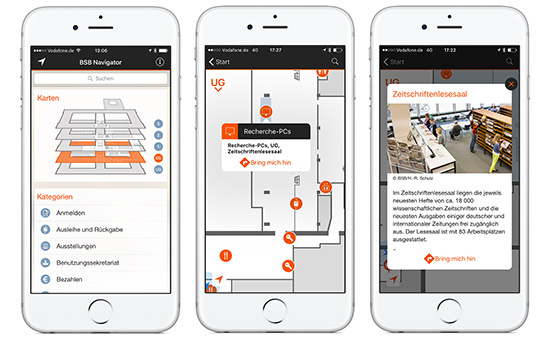 We gave it a try and developed an indoor navigation app for a large building in Munich. This lecture will present the lessons learned during this project. 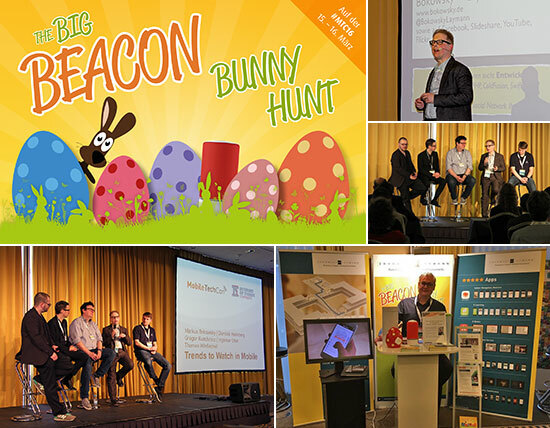 What is possible with Beacons and what is not yet? Which challenges did we encounter, which trade-offs did we have to accept? What needs to be taken into consideration when selecting hardware and software? Re-publica is turning 10! Hard to believe. From May 2 to 4 the German Blogger and Social Media Scene as well as almost everybody who has to do with the Internet will be meeting at Station Berlin. This year for the incredible tenth time! The program? No matter, surely fantastic as always. See you! an interactive map that shows all floors of the building that visitors are allowed to see. You can select individual floors and the app always shows your current position as soon as you open it. Indoor navigation in real time that leads you from your current position directly to your chosen destination within the building. 90 points of interest and destinations showing additional information (opening times, services etc.). 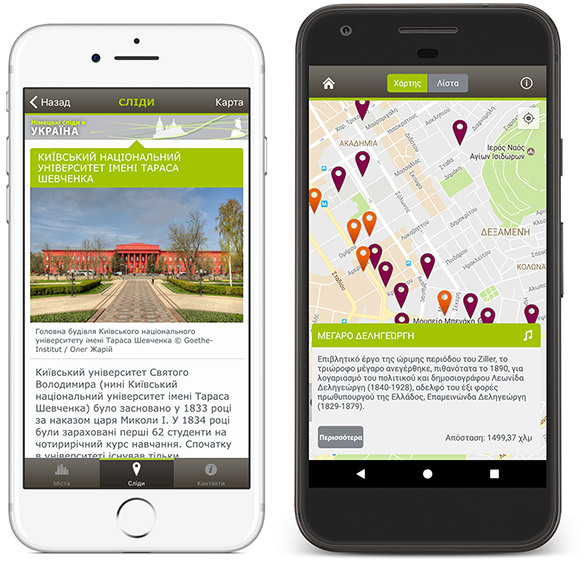 a discovery mode that gives you additional facts relating to the library, about objects and places that you are walking past. a tour function that guides you through the library, along a previously-selected route, past points of interest. There are currently two tours available: the 'general tour' for new users and the 'tourist tour,' a guide to the main highlights of the Bavarian State Library, with information specifically for tourists. 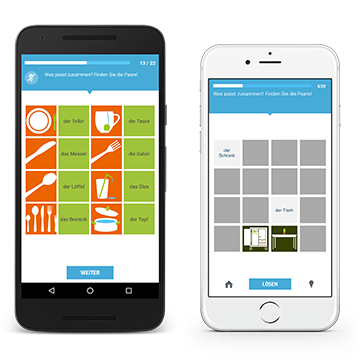 Once the app is installed on your smartphone and bluetooth activated, you can touch the “take me there” button on the room maps and start navigating. Since GPS navigation does not work within buildings, the app uses so-called beacons instead. As part of this project, 245 bluetooth signalling devices were installed throughout the Bavarian State Library complex in all rooms open to the public. 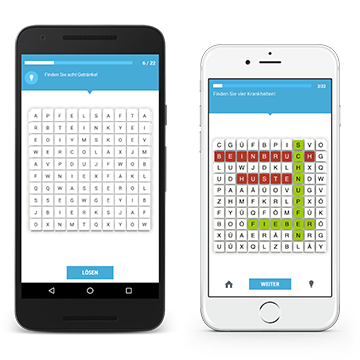 Each device emits low-energy bluetooth signals in regular intervals, allowing the app to determine your position at any given time. This is a combination of several technologies; firstly, it calculates your proximity to a beacon. Secondly, trilateration, a method that we know from mobile communications and thirdly, so-called fingerprinting. This required 'measuring out' the entire building with a special app by placing 'fingerprints' every few metres. 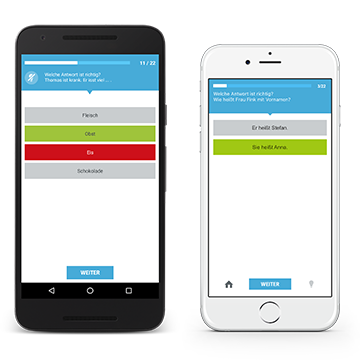 The app measures the signal strength and distance to the nearest beacons and writes this information into a database. The app also uses these values to determine your current position. Smartphones are equipped with additional sensors that are used to determine, for example, the perspective (compass, gyroscope) and the floor you're standing on (barometer). 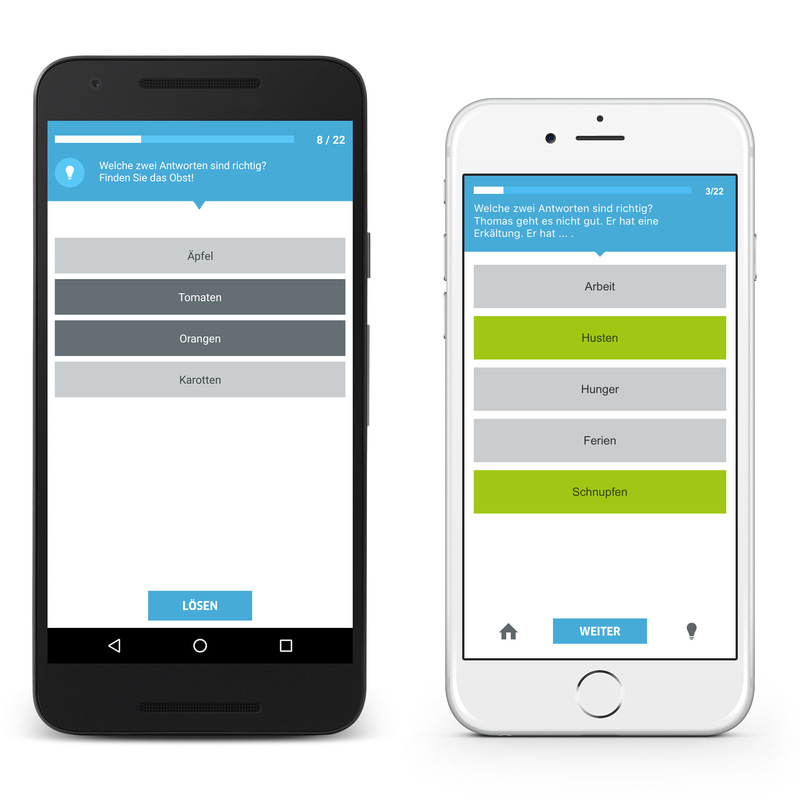 To calculate position and routing we used an SDK, developed by Austrian start-up indoo.rs. As a supplier for the beacons we choose kontakt.io. 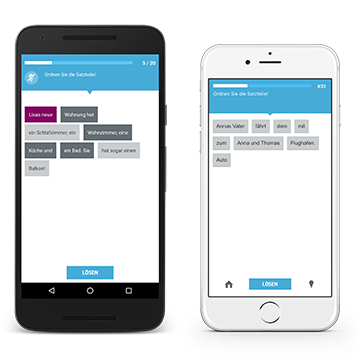 For the administration of the beacons we added a beacon management function to our approved Location-Based Services Tool. 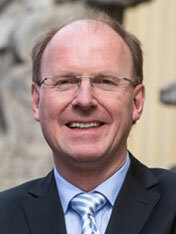 The content management system is identical to the one already in use at the Bavarian State Library. We consider Indoor Navigation using beacons will greatly gain in importance since its technology is now financially feasible. Contrary to large proprietary systems based on Wifi, you are not dependant on a sole manufacturer. Beacons represent today's standard. You can choose between many different manufacturers and prices are calculable. This will make indoor navigation possible since they are affordable for a large number of buildings and objects. 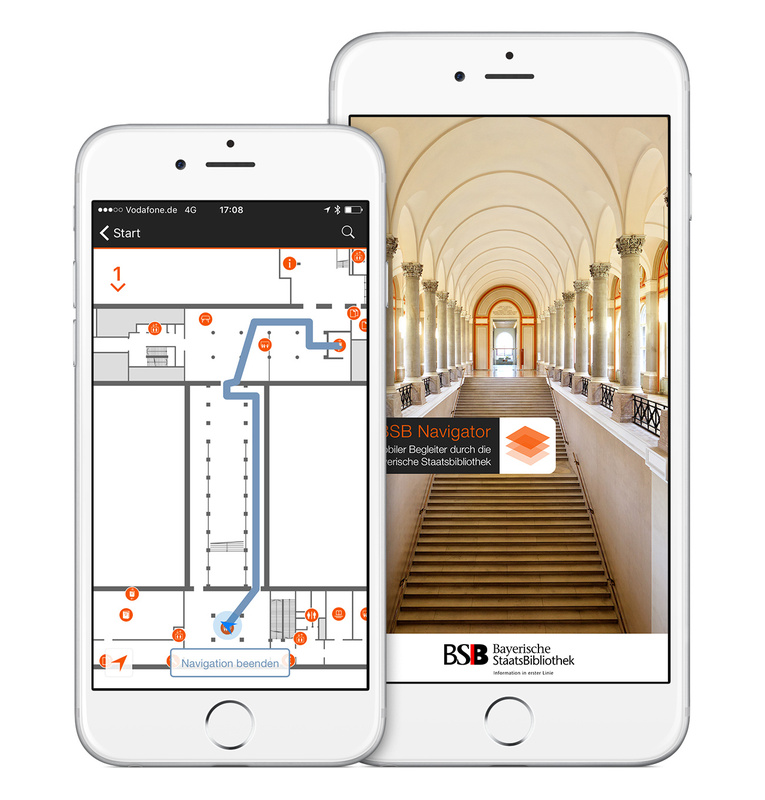 The BSB Navigator app is available for iPhones since 3rd March 2016 and can be downloaded for free in the App-Store. 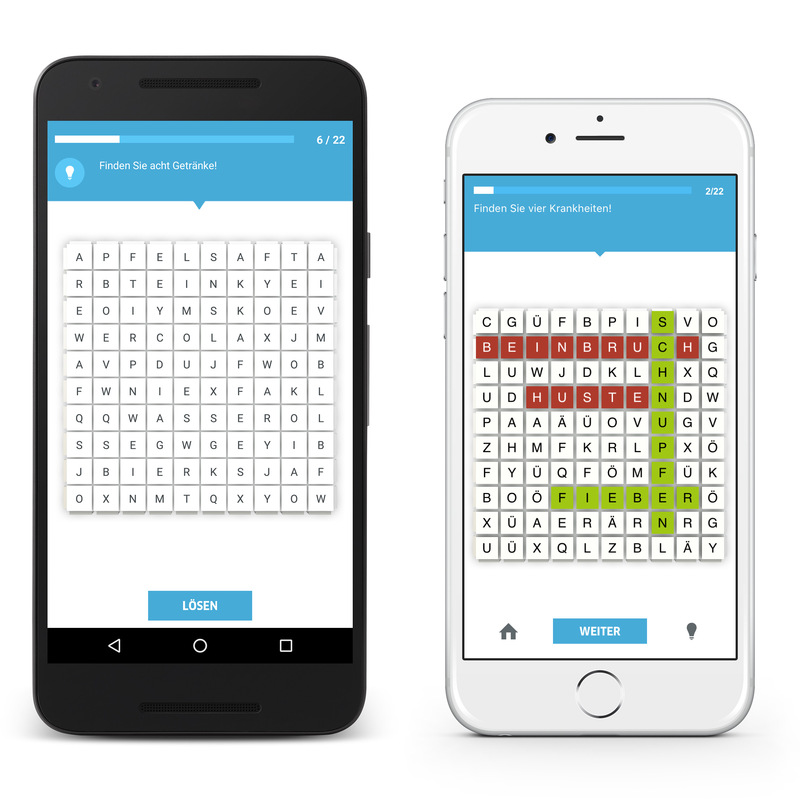 An Android Version is currently in development and will be released summer this year. The app is available in English and German. 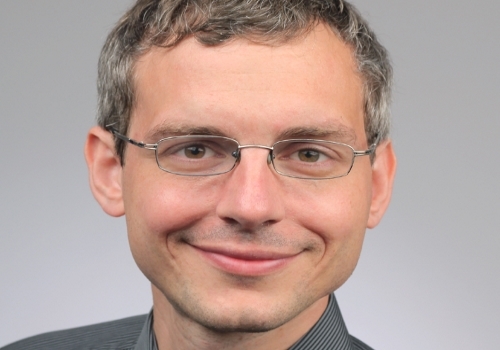 If you want to learn more about the project from the perspective of Bavarian State Library, one of the major European universal libraries, you will find an article written by Dr. Klaus Ceynowa, Director Genaral of the BSB, about the development of the BSB Navigator. 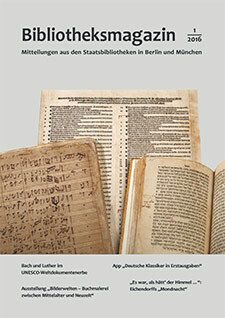 It was published in the latest issue of Bibliotheksmagazin (in German language). Here we go again: MTC’s spring edition in Munich is just around the corner. 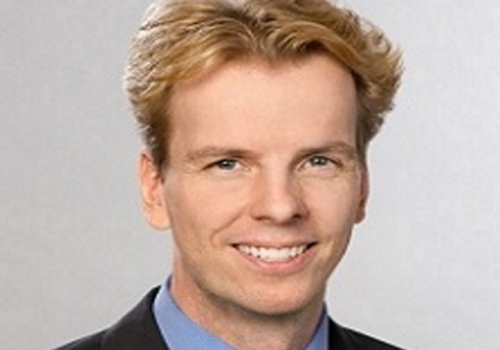 Once again, Markus is member of the Advisory Board and in charge of the Business Track. We strongly recommend the talks of Dr. Mark Leach Digitalisierung als Herausforderung für Automobilhersteller (Digitization as Challenge for Car Manufacturers) and Dorothea Kolossa on Automatische Spracherkennung auf dem Weg in die Praxis (Automatic Speech Recognition on its Way into Practical Application). 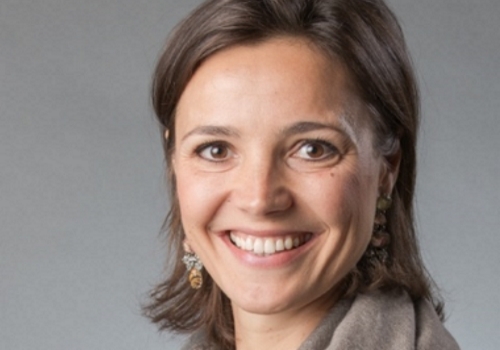 Tina Trinks from Fairphone will deliver an inspiring keynote and Jessica Groopman from Harbor Research will offer us an intriguing glimpse into IoT at Silicon Valley. Of course we are also at the conference with our booth along with our fritz-kola fridge and a wealth of surprises which of course we are not telling yet. Just drop in! In his talk Markus will introduce the technology behind indoor navigation with Beacons and talk about the lessons learned during the BSB Navigator project. 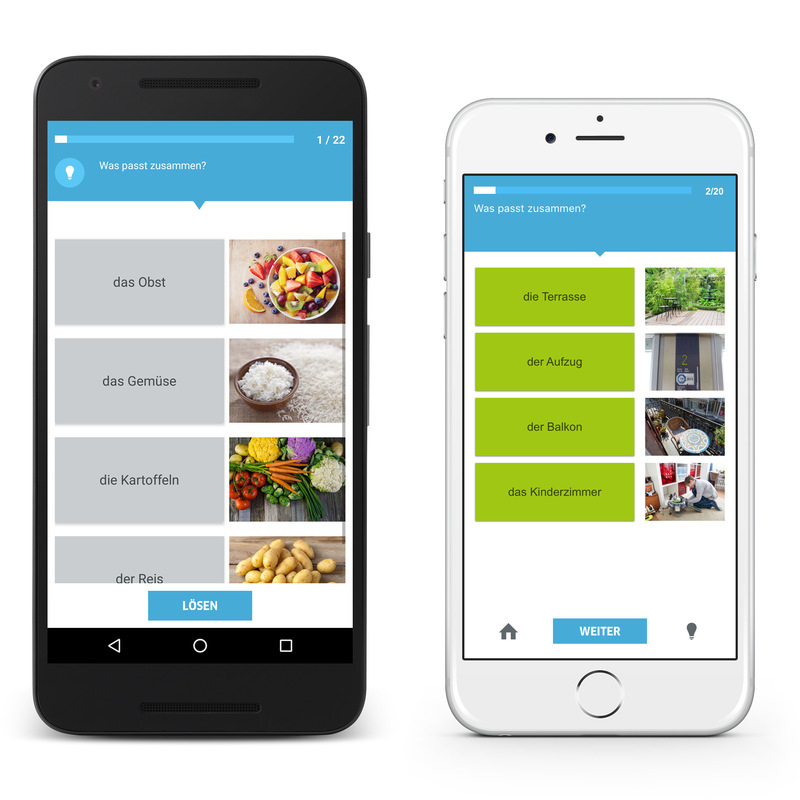 Indoor-Navigation with iBeacons – a use case. Particularly interesting for our Munich-based readers: On Tuesday the MTC/IoT Night will take place, featuring lectures and a panel. Attendance is free of charge. Yes, it still exists. And maybe worth a trip. This year’s partner country is Switzerland, the motto is d!conomy. In hall 13 everything is dedicated to IoT and Phil Zimmermann will hold a keynote at CeBIT Global Conference. The start-up show code_n turned into SCALE11, 250 start-up companies are expected to exhibit on 15 display categories. Two weeks of madness in Austin, Texas, as every year unfortunately at the same time as MTC. The interactive Track, the world meeting of the Internet industry, will take place from March 11 to 15. Attention: For the first time ever, from March 16 to 18, just back to back with SXSW, the VR/AR Experience will be held. Who plans to visit SXSW should consider staying those two extra days.